I was a ridiculous kid. Stubborn, bookish, bossy and opinionated. I got into trouble for speaking out in classrooms (“But Mrs. Weaver, I don’t want to do that next”) and for making a face whenever my little brothers ate some food that I thought was disgusting. Take fresh green beans from my grandmother’s garden, for example. Our green beans came in a can at home and I wanted them in a can at Grandma Virgina’s, thank you. My mother would sigh, tell me I’m crazy and crank open a can of Green Giant. I came to my senses and stopped eating canned green beans years ago, but I never replaced them with fresh green beans. You know that little squeak you hear when you bite into a cooked, fresh green bean? My younger self did not agree with food that squeaks, and I’m not sure my adult self does, either. That said, I couldn’t pass up these multi-colored string beans from Kansas City’s River Market last Saturday. Surely I could find a way to make these enjoyable, I thought. Then I zoomed over to Trader Joe’s for a “quick” grocery run, but of course I couldn’t find everything I needed there. Not one to give up, I found myself at a second, third and fourth store. Maddening, right?! By the time I got home that evening I was so cranky that I felt like taking a tequila shot for each of the four stores that don’t carry tahini. Fortunately, I didn’t need any of those ingredients to make this improvised end-of-summer quinoa salad. I’ve seen quinoa at big grocery stores lately and green beans shouldn’t be hard to come by this time of year. I used a technique similar to that of last week’s broccoli pasta: sauté the green beans for a few minutes, then cook them all the way through by steaming in a bit of water. You’ll end up with squeak-free, crisp-tender blackened beans, which contribute tons of flavor to the finished salad. Before I go, I feel compelled to tell you that something was missing from this salad when I photographed it, but I couldn’t figure out what that something was. I finally recalled the classic almonds-with-green-beans combo from my grandmother’s table and threw some slivered almonds in a pan to toast. Almonds make all the difference, so even though they aren’t shown in the pictures, please add them at the end as directed. And hey Mom, look! I’m eating real green beans and not taking tequila shots. Your little girl is all grown up. 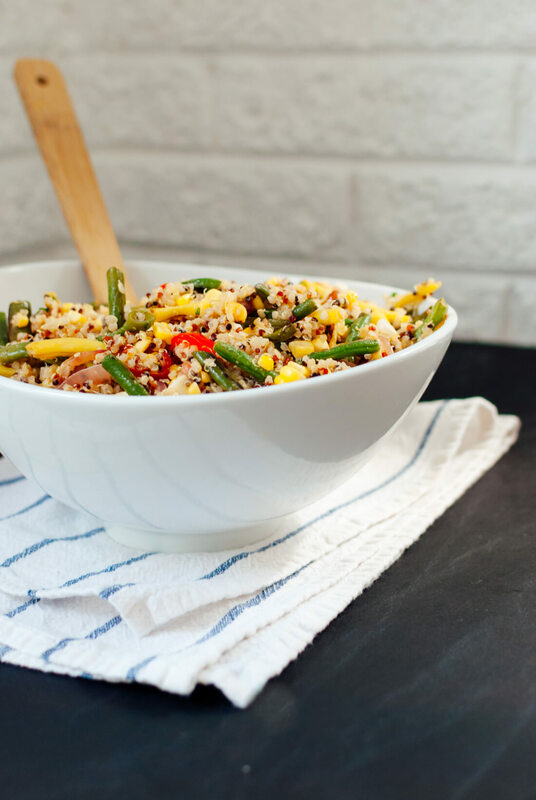 Sautéed green beans in a simple end-of-summer quinoa salad with corn and cherry tomatoes. Top with toasted almond slivers (mandatory) and feta (optional)! In a medium saucepan, combine 2 cups water and the quinoa. Bring to a boil, cover and simmer for 15 to 17 minutes, until the water is absorbed. Remove from heat, fluff with a fork, cover and set aside. Chop off the straggly ends of the green beans. Cut them on the bias (diagonally) into 2- to 3-inch long pieces. Heat 2 teaspoons of olive oil in a 12-inch cast iron skillet over medium heat until shimmering. Add the green beans and a sprinkle of salt and cook, stirring occasionally, until spotty brown (4 to 6 minutes). 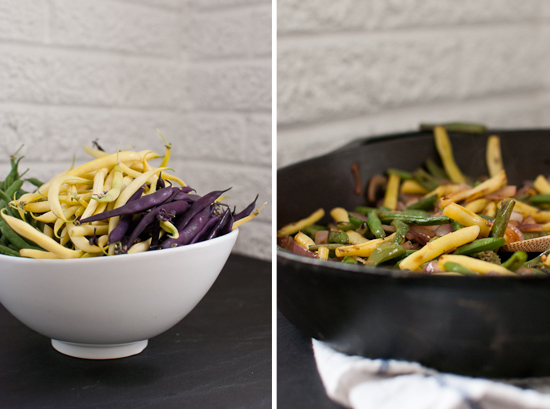 Use a wooden spoon to push the green beans from the center of the skillet. Add another teaspoon olive oil and the minced garlic. Cook the garlic until fragrant, about 30 seconds. Stir the garlic into the green beans. Grab a baking sheet to cover the pan and keep it handy. Add the red onion to the pan, followed by the water and cover until the beans are bright green and crisp (about 2 minutes). Uncover the pan and increase heat to medium-high. Cook until the water evaporates and the beans are lightly browned (3 to 5 minutes) and remove from heat. Transfer the green beans to a big mixing bowl. 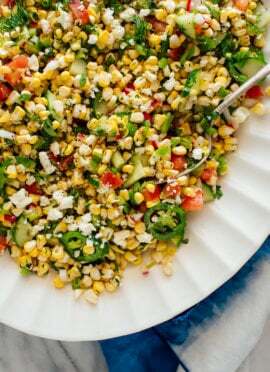 Add the cooked quinoa, chopped cherry tomatoes and corn kernels. Whisk together the dressing ingredients in a small bowl and pour it into the salad bowl. Toss to combine. Add salt to taste. If it doesn’t taste like an end-of-summer party, add another squeeze of lemon and maybe a dash of red pepper flakes. In a skillet over medium-low heat, toast the almond slivers until fragrant and golden. Top the salad with toasted almonds and feta, if you’d like, and serve. Green bean cooking technique adapted from The America’s Test Kitchen Healthy Family Cookbook. Make it vegan: Skip the feta. Make it nut free: Leave out the almonds, although it is a highly recommended topping! Storage suggestions: This salad keeps well in the fridge, covered, for a couple of days. Mmmm. It looks delicious. I say throw feta cheese on ANY salad and it makes it yummy! Wow this looks amazing, my kind of salad! Those beans are so beautiful! I hate those days where you know exactly what you are looking for at a store, should be easy in and out and then you end up on a wild goose chase. One of my biggest pet peeves for sure. Ah…I have a couple of those children at home. Oy. But I would afore this salad! I am all too familiar with those four-stop grocery days – and yes, it is absolutely maddening. I’ve convinced myself that it comes with the territory of being a plant based eater, but it still drives me wild when I go somewhere only to find they don’t stock tamari. Or almond butter. Anyhow, this salad looks delicious. To this day (mind you, I’m a grown human), I refuse to eat green beans unless they come from my Oma Eva’s garden. So, maybe I’ll be able to convince her to make this for me when I go home. She would think she was sooo hip for cooking from a recipe on the internet. Why is almond butter so hard to come by, anyway?! It’s 2012! C’mon, grocery stores. If you make this salad with your Oma Eva, I hope you both love it. I would love to share the salad with your bossy little self, but what I really can’t wait for is to share tequila shots with the new green bean veggie eater your mama is so proud of. I love fresh green beans, what a delicious salad! Someday, Ashley, I’m going to visit NYC again and we will take tequila shots! Mark my words. Ah mom would be proud, no tequila and eating green beans! Loos delicious, I want to make it soon! Great blog by the way! MMM looks good! Thanks for sharing. This looks so good BUT what looks even better is that you are a fellow KC whole foods eater!!! I actually taught a class on greens at the River Market kitchen earlier this summer! So fun! That is great, Katie! Let me know if you teach another class soon! Love quinoa! And I have too much of it in my pantry – about 10 pounds. I hear you… Don’t you hate that when a quick little trip to the market, becomes a shopping odyssey. I get SO grumpy too. Love your quinoa salad ( I’ve got quinoa on the brain myself). 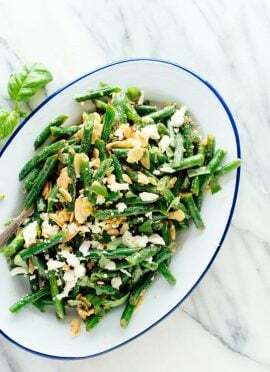 Green beans, almonds, feta… all good to me! A shopping odyssey! Precisely the term I was looking for. Thanks, Erin. This looks super yummy! 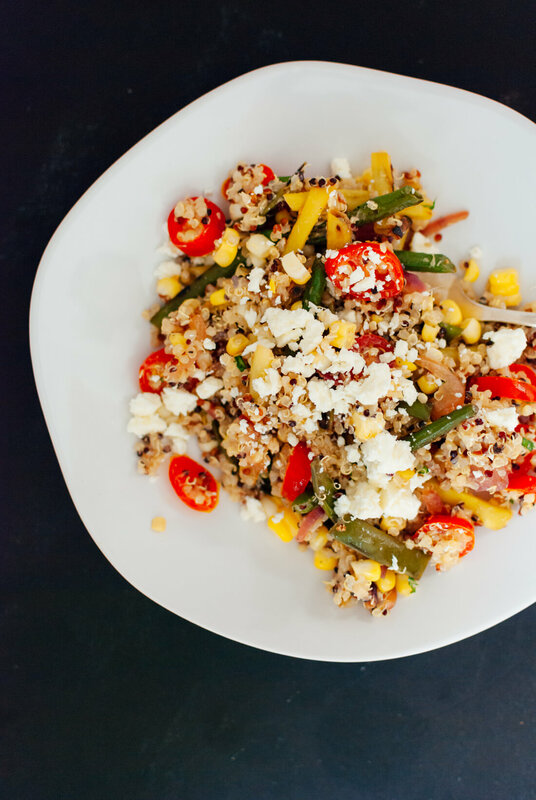 Quinoa is definitely my grain of choice and it’s always refreshing to see another way to use it in a recipe! The blackened green beans is an innovative new kick! Thanks! 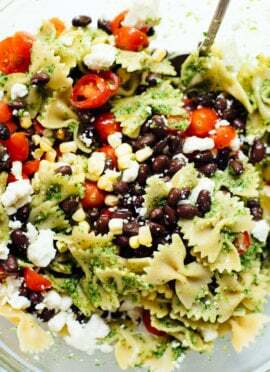 The colors look amazing, maybe I can get my little picky eaters to try this yummy dish! Love the colorful green beans! I’ve always wanted to grow the purple ones. Oh this recipe sounds nice. Just tried quinoa for the first time last week. And I loved it! So nice to find some more recipes that looks delicious! Nice pictures! Pine nuts are good with this if you don’t have/want almonds. I also made it another time with Trader Joe’s Omega Trail Mix that has an assortment of nuts n seeds with dried cranberries and it worked really well. PS: Saw the West Elm piece. Congrats! Glad you’ve enjoyed this salad, Luis! It didn’t go over as well as most of my other recipes lately in terms of comments (maybe people don’t like green beans?!). Pine nuts and assorted nuts sound like great substitutions. Thank you for the congratulations, too! Love this! I made this on Monday and it makes a lot so I’m having a big bowl for lunch today, warmed up a bit in the microwave. I also used bulghur wheat instead of quinoa because I had it on hand. Glad you enjoyed the salad, Tracy! I bet it would be great with bulghur wheat. Delicious! I was searching for a recipe to use up the tomatoes, green beans and corn that came with my CSA share, and this worked out great. Thanks! Thanks, Jenny! I’m so glad you enjoyed the salad. This might actually be my favourite grain salad ever. The combination of textures is phenomenal– definitely don’t skip the toasted almonds! It’s a little bit involved but if you multitask it comes together fairly quickly. I’ve made it several times now and will definitely continue to do so as long as I can get fresh sweet corn! Elinor, thanks so much for your feedback on my recipes! I’m delighted that you enjoy my recipes and share them with your family. Wow this was amazing I savored every single bite. I made this in the winter even though it is a summer dish but it was still fantastic! Can’t wait to taste these veggies once they are in season. The toasted almonds and feta cheese really gave it a burst of flavor. Thank you Kate! Thanks, Abbie! Glad you enjoyed it! I made this last night and it was fantastic. It made more than what I’d consider 4 servings though so next time I’ll use less than a cup of quinoa and use more greenbeans. Even my husband loved it and we both had seconds. One of my new favorite C+K recipes! Thanks, Winnie! I’m so glad you both enjoyed it! Thanks, Kate! I was linked to this in your July guide. Loved how quickly this came together and the flavor combo. I’ll definitely enjoy the leftovers for lunches! Thanks for the great recipe! I made this yesterday for a picnic, using farmers market beans, tomatoes, lemons, and corn and it was absolutely delicious. I followed the recipe and used both feta and almonds as toppings. But – am I the only one who has trouble with the 2 to 1 ratio for quinoa? I used a tri-colored quinoa from Whole Foods and had a lot of water left after 15 minutes. I turned up the heat and cooked a few more minutes, but it ended up quite mushy. I threw this out, and made a new batch with nearly ~1.25 (water) to 1 ratio with much better results. I did let it sit in the pot for a while after cooking, so the steaming time may have helped compensate for the lower water, but really the quinoa was fluffy and perfect. I have had this happen before as well. Anyway, thanks for a great picnic recipe, we really enjoyed this! OMG I just made the Blackened Green Bean Quinoa Salad and am trying to hold myself back from the entire bowl. Super fun as I just harvested beans, tomatoes, and basal from our community garden plot with garlic we grew last winter and corn fresh from a farmers market run. In the spirit of Cookie my dogs Gracie and Cooper picked up any crumbs. Full disclosure, the story with this one cracked me up as I am a very old friend your mom’s from home (and know Virginia) and perhaps the last time I saw you may have been during that stubborn very young phase ha! So I laughed as I ate. LOVE this sharing it with my garden buddies. Hi Laurie! That is awesome. Thanks for saying hi. I’m so glad you enjoyed this one! I love quinoa! I use it all the time. Thanks for this. Made this for dinner last night and it is incredibly delicious! I also want to say that my partner and I make dinner pretty much every night from your foodblog and, now too, your cookbook, which we purchased last month. I really love how you use fresh food and there are no attempts at faux meat. I always feel great after I am eating a recipe from here and it is always delicious going down! I have so many favorite recipes of yours that I never get tired of cooking from here. Aw, thank you, Kendra! I’m so glad the two of you enjoy the blog and cookbook so much. I appreciate you taking the time to comment! Absolutely amazing! Glad I read about the toasted almonds. This is a great recipe. Thank you so much! Thank you! I appreciate the review, Addie. I can’t wait to make this tonight for dinner. I have left over string beans that we blackened on the grill in a grill pan over the weekend that I am going to use..
Just made this and INHALED my first bowl… about to go back for seconds. Wouldn’t change a thing, so delicious! I made myself this salad yesterday and OH MY GOSH GIRL. YOU HIT THE NAIL ON THE HEAD. THIS IS SO GOOD. Thank you! I’ve been trying to incorporate more vegetables and non-meat-based proteins into my diet and this is just perfect. THANK YOU! Ha, well thank you! I’m happy you like it that much. Thanks for the review, Lauren. Great and easy! My daughters loved it and so do I. Keep up the good work! Love this is a family hit. Thanks for your review, Carolyn! Made this recipe last night and my family loved it! So light and fresh and a great use of fresh seasonal produce. I used one juicy medium sized lemon, extra basil because we had lots from the garden, a little bit of feta and the sprinkle of red pepper flakes like you suggested. Even without the almonds which we didn’t have on hand, this was a fantastic recipe! Wonderful, Denise! Thanks for your review.